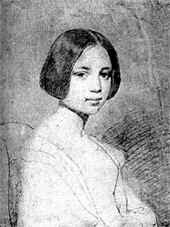 Sarah Elmira Royster Shelton was an adolescent sweetheart of Edgar Allan Poe who became engaged to him shortly before his death in 1849. Their early relationship, begun when she was 15, ended due to the interference of her father while Poe was studying at the University of Virginia. Two years later she married Alexander B. Shelton, who became wealthy through his involvement in the transportation industry. The couple had four children, though only two lived past infancy. After his death in 1844, Royster and her children inherited $100,000 with the stipulation that she would lose a portion of this estate if she remarried. Poe came back into her life in 1848 and they renewed their relationship. Poe pressed her to marry him, though she was hesitant and her children did not approve. They never married; he died shortly thereafter in October 1849. Royster had an influence on Poe's work and may have inspired "The Raven" and "Annabel Lee". The early relationship between Poe and Shelton was immortalized by other writers, including Poe's brother William Henry Leonard Poe.